A collection of various projects I have completed that do not fit into other categories of the website. Red Shadows are from the United Kingdom version of G.I.Joe. In the UK the Joes were called "Action Force" in the beginning years, and their enemy was an army of red uniformed fanatics known as the Red Shadows. This is a side project I have been meaning to do for quite some time but just never got around to it. 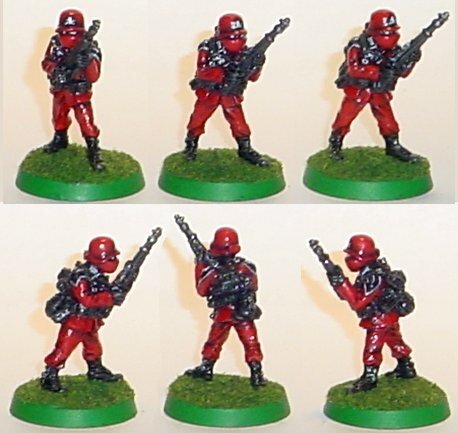 Ever since I first started painting the 28mm German soldiers I had a urge to convert some of them into Red Shadow troops for use in tabletop gaming. So as it happened I had just finished filling the gaps in a model tank and had a small amount of sculpting putty left over, and here was this extra German soldier model sitting on the table without a purpose so I thought what the hell, its time for a Red Shadow. The Red Shadow troopers are wearing the exact same pattern of uniform as a German soldier and even have the same web gear and field kit, so the conversion was as easy as sculpting on a faceplate and the little power box on the back of the helmet. With a conversion process so simple, making up an army of them should prove straight forward enough. I used the same basic paint process as used on the German soldiers with all shading done using black washes to keep the figure from being too bright and keep the palette simple. For the web gear I first painted it a gray/brown color then shaded it in with black. This way it would look black while still showing the details of the gear without requiring highlights. After all the base colors and shading had been applied I went back and added the black and white shoulder details, collar and helmet insignia, and the white eyes. The little buttons and buckles here and there were picked out in silver. A clear coat and a simple green flocked base finished up the figure. For now I just have this initial test figure, but as more are completed they will appear here. This is my test sample of a custom Red Shadow trooper, done to determine how long it would take to convert them and what colors would be needed for the proper effect. 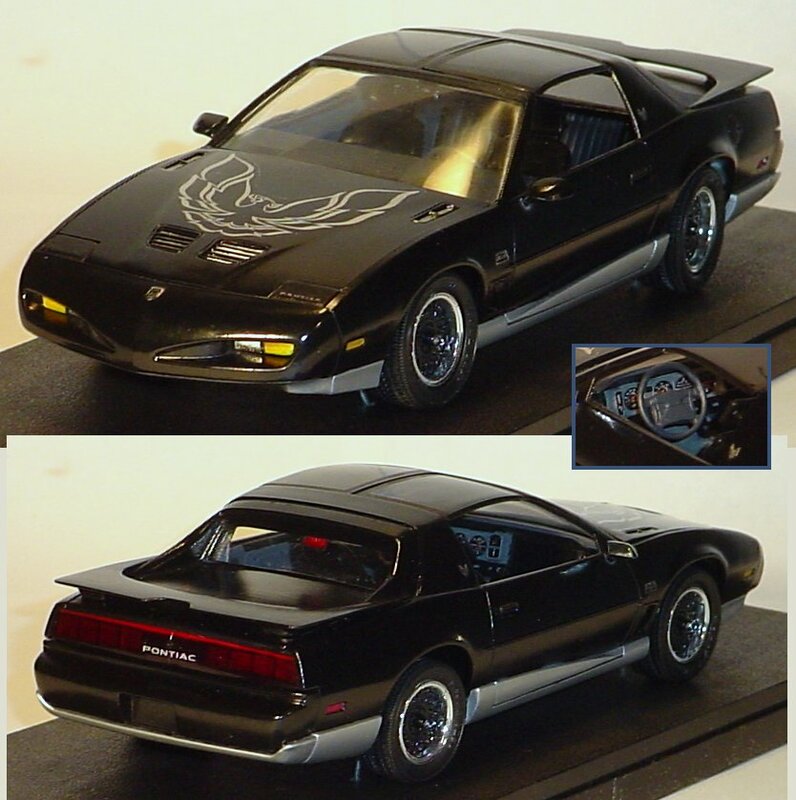 This is a heavily modified ATM model kit for a 1991 Firebird GTA that I customized to be an exact replica of my real car that I had just recently given a full overhaul. A couple of changes were required to convert this car to look like my real one, and that was were the fun began. Since mine is also a 1991 model the basic body style was right, but this model kit has smooth fenders and mine has vented fenders. The seam outline of the vents was carved into each fender with an etching tool, then the center was cut out and the shape of the vent sculpted in with putty. All in all a rather simple modification compared to the other required change that was needed. 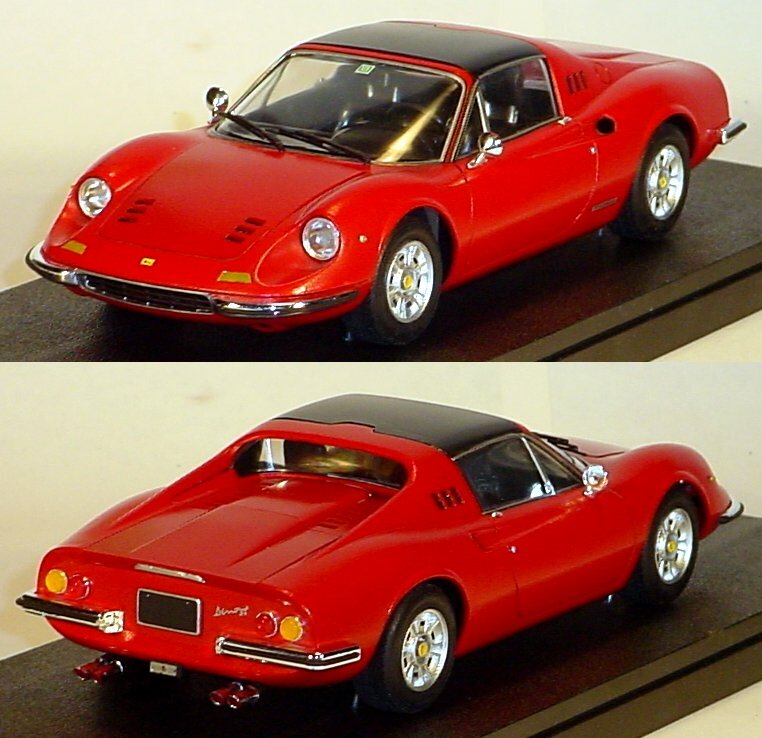 The second mod was a dramatic change to the rear window, this model kit has the normal hatchback dome seen on 99% of these cars, while my actual car has a different rear hatch known as a notchback. In order to make the notchback hatch for this model kit, I had to cut apart the existing rear window and use its outer frame for the basic shape, while building the lower deck with plastic card and sculpting putty. In total it used four pieces of plastic card; one square piece for the flat lower deck of the hatch, two long triangular pieces to fill the gaps on the inner edges, and one piece with the center cut out to use as the new window frame. The back window itself was made from a piece of overhead projector transparency film trimmed down and glued from the inside. Once these two conversions were done it was just a matter of painting it all up and getting it decaled. The interior uses a combination of three shades of gray along with black. The headliner is light gray, while the carpet, most of the interior panels and the gauge trim panel is medium gray. The sides and armrest of the center console along with the steering wheel, shifter, and parking brake handle are all dark gray. 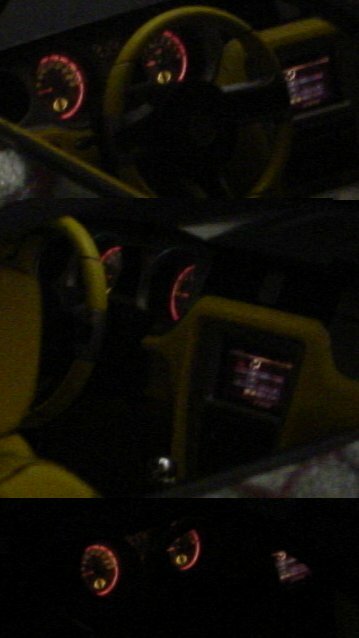 The front of the dashboard and the top of the center console are black, along with the panels around the inner roof. Seats are black with dark gray centers. The color scheme for the outer body is primarily black, with silver for the ground effects and the mesh found in the vents on hood and fenders. The emblems on the nose and fenders came on the model and were painted with silver and black, as well as the small bird emblems behind each side window. I used some custom made silver decals for the Firebird on the hood and the Pontiac lettering between the tail lights. The car is mounted on a display base with the glass cover removed to prevent glares when photographing. This is a deluxe model kit by Testors that I picked up some time ago, its over a foot long and loaded with details. 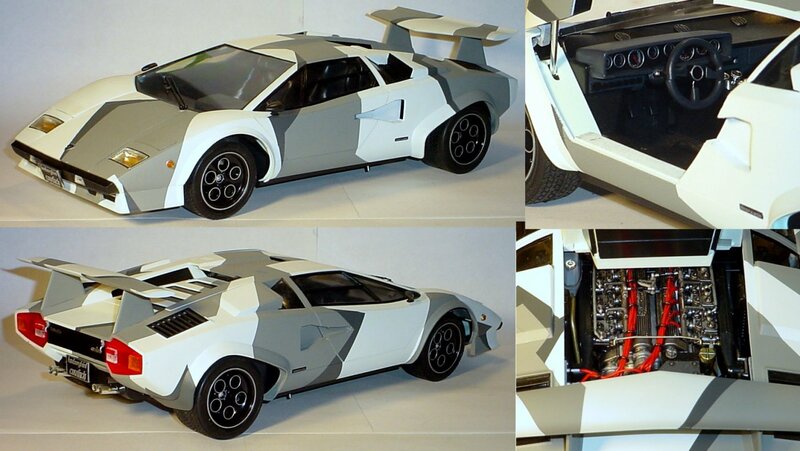 This one had to be painted as it was built, starting with the engine and frame, then the interior and trunk area. The engine was very intricate and even had individual rubber spark plug wires that look very realistic. The interior was done out in a mix of black and dark gray, with silver accents. Once all this was ready I assembled the main parts of the body in order to paint the entire thing in one go. I knew from the start I didn't want to do just another Lamborghini, there needed to something unique about it to set it apart and that unique feature was going to be a bazaar arctic camouflage pattern. The pattern I decided on was a very angular style seen on World War 1 and 2 battleships, usually rendered in black and gray. I thought the sharp angular style of the camo would compliment the sharp angles of the car body quite well and give it a very unique look. The basic battleship camo pattern was added in white and gray, then a darker gray color was added along the edges of the light gray patches to add some contrast. After the body was painted the windows and lights were installed and then the body was mounted onto the car frame. The accessories on the outside such as the bumper, vents, etc were left black as on a factory Lamborghini and to tie in with this I also painted the rims black with silver edging. Now the car was down to the final touches. This kit didn't have decals, instead the emblems had actual molded details that had to be hand painted and look much more real than a basic water slide decal. After getting the emblems painted and the side mirrors installed it was ready to go. Some shots of the car, along with a view of the instrument panel and highly detailed engine. I first saw a car of this type on a televised auto auction and it immediately caught my eye, so I set about finding a model to build for my collection. This proved more difficult than I expected, the basic Dino GT model was easy to find but it took quite a bit of searching to find one of the more distinctive GTS types that wasn't outrageously priced. The model I finally found was from a Japanese company called Fujimi, and the quality of the kit was quite impressive. Since the car I saw on the auction that I liked so much was purely stock, I didn't want to stray from that for this kit. Everything is done to the original specs including a black interior and the traditional Ferrari red paint job. The roof apparently came in two styles, both of which are removable. One type was painted the color of the car, and the other was made of a black transparent material like a sun-roof. I opted for the black version to make it more obvious that the roof is removable. This is the Shelby Cobra GT-500 Mustang from 2010, a real monster of a super car designed by the master of high powered engines; Carol Shelby. This one is in a massive 1:12 scale, which allows for some extreme detailing compared to the normal 1:25 scale car. I had been looking for something cool and modern in this scale for quite some time to really go to town on, and was just waiting for the right car at the right price. I knew in a car this size I wanted to do some lighting in the dash for the gauges, and some detailed wiring in the engine compartment but I hadn't given much thought to the actual paint job or color scheme. When I saw this awesome Mustang available for a bargain I couldn't pass it up, it was just too perfect and immediately gave me some ideas. 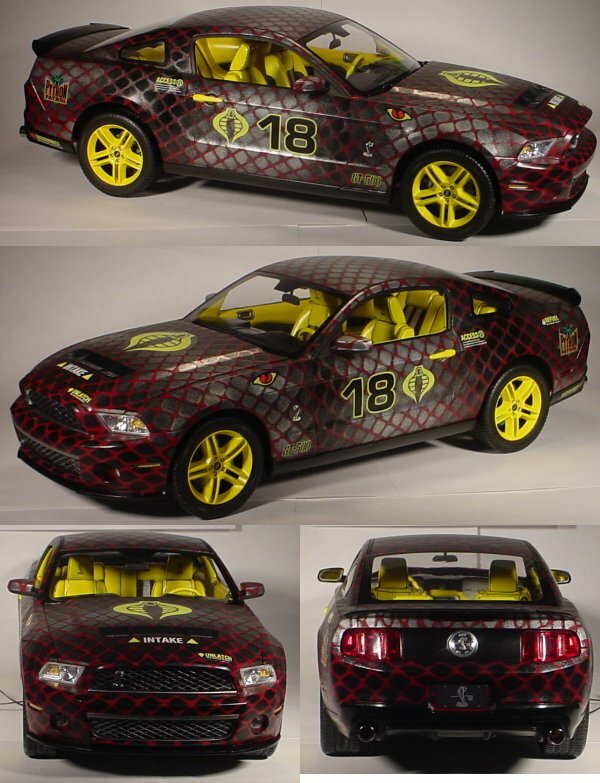 Here we had a Shelby "Cobra" Mustang, what better color scheme than a Cobra Command Cobra Mustang? This car would be double the Cobra. 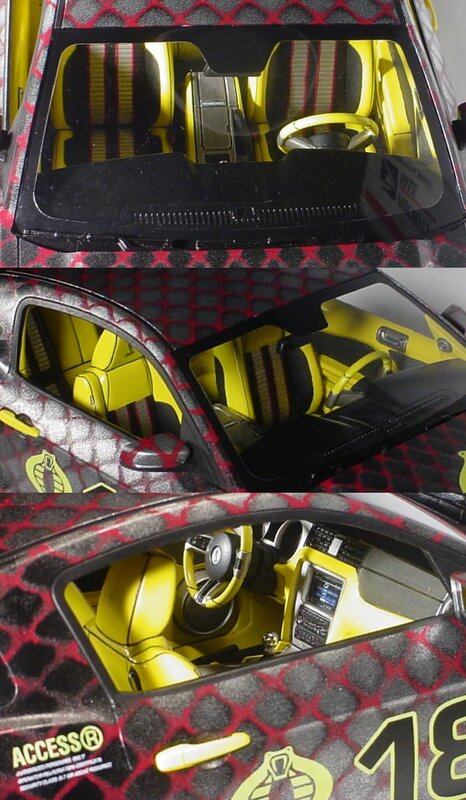 It could even have all the labels and logos just like an actual Cobra vehicle but with much higher detail. I considered at first either a solid dark blue like the ASP, or Black and Red like the STUN. I couldn't really decide on which to do since on one hand the blue would look cool but be rather plain, while the black and red would look like one of the existing stock color schemes available on this car. After some thought it occurred to me that a Python Patrol scheme might look very striking, and it would allow me to use some of the mesh I had that was too big for using to paint Joe sized vehicles but had nice "scale" shaped holes in it. The color layout I decided on was standard Python Patrol scale patter for the entire body, with black for the ground effects and spoiler. Since this had no guns to paint the yellow on, I decided to make the wheels and door handles yellow instead along with the interior. I made up some decals of the standard Python Patrol style with Cobra logos, snake eyes, and assorted labels to supplement the stock decals included with the model. The cool thing about decals in this scale is the little warning labels and such can have the actual tiny text printed below them instead of just a few straight lines like was common on Joe vehicle. The Interior was done primarily in yellow and black with some silver and burgandy mixed in. The seats have dual silver stripes down the black center portion, and each stripe is outlined in burgandy stitching. A Shelby Cobra emblem is added to each headrest to resemble an embroidered logo. The dash and center console are done in yellow with brushed steel faceplates and console lid with a few chrome accents. The floor carpet and roof headliner are both black, While the sun flaps and overhead console are yellow. I added backlighting to all the gauges and GPS screen to give that final touch of detail to the interior, with a custom printed gauge cluster for the dash so it would be in Python Patrol colors to match the interior. The first two pics of the gauges are in dim lighting, the last one is with no light. A load of detail was put into the engine compartment, working from engine photographs of the actual car. 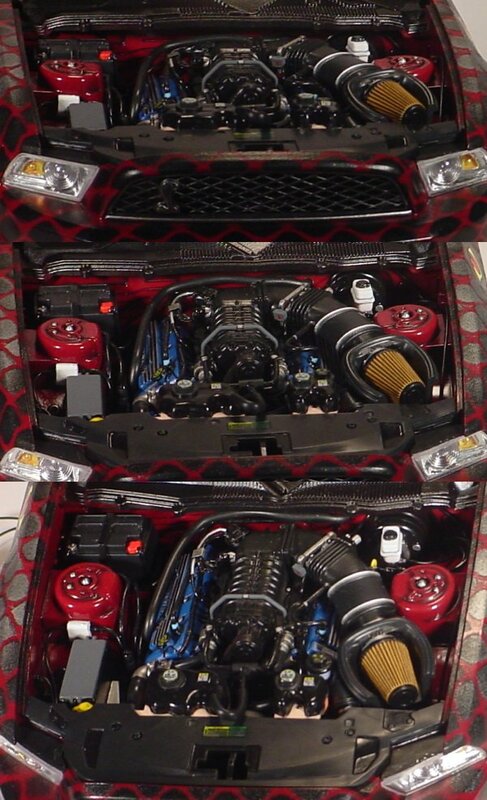 The engine was fully painted and shaded in aluminum silver with blue valve covers and a black supercharger. Once painted it was attached to the car frame and then the entire network of assorted wires and coolant hoses was laid out in the engine compartment just as they were in the reference photos. Tiny labels where painted on wires, the blue sealing tape was added around the sensors, wiring harnesses of different sized wires were carefully woven together and directed around the engine... it got crazy. In the end it was one heck of a project but I think the result was well worth it. The Python Patrol color scheme combined with the decals really makes it stand out, and gives it a very racy look like something you would see in Nascar if Cobra Commander got involved. First are the exterior pictures, followed by some interior shots and a close up of the backlit gauges, then some engine pictures. When I saw that this kit was the same scale as my other military models, I had to have it. 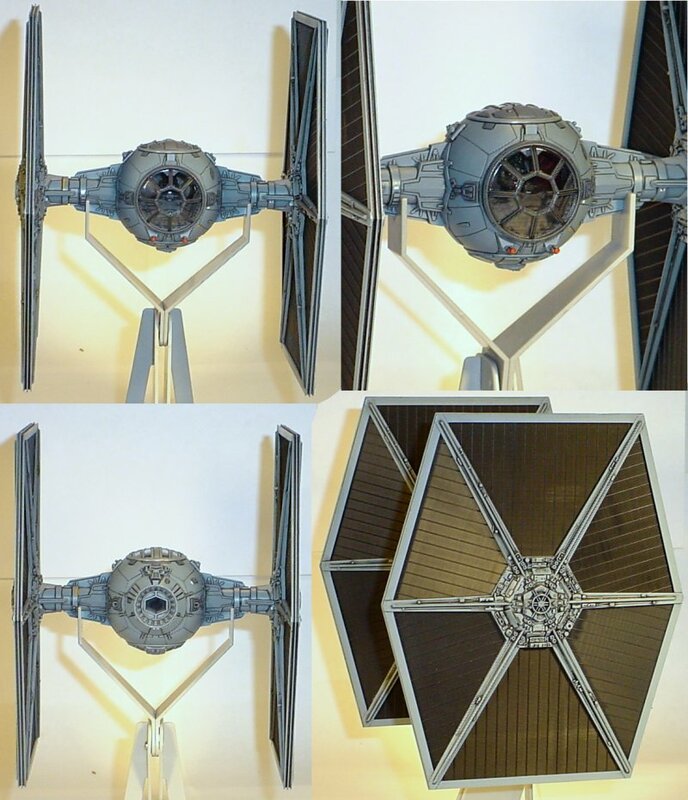 This kit is made by a Japanese company called Finemolds and has a very impressive level of detail, especially compared to most other Star Wars models available. I kept this one fully textbook with the blue/gray color scheme for the hull and a darker gray for the window frame and other small hull details. The interior was done in medium gray with the pilot wearing a standard black Imperial pilot uniform. The interior had to be painted first and the hull assembled around it, with the window openings taped off during painting. The wings were left off for the time being and unassembled so the frame portion could be painted separately from the black panels. Once everything had its blue/gray base coat I went over the entire thing and added some dark wash to the recesses to better define all the small details. Once the paintwork was done the wings were assembled and attached to the hull, along with the cockpit windows. The exterior decals added the final details to the model and it was ready for display. The model came supplied with its own stand which I left unpainted to prevent paint from rubbing off onto the wing struts.